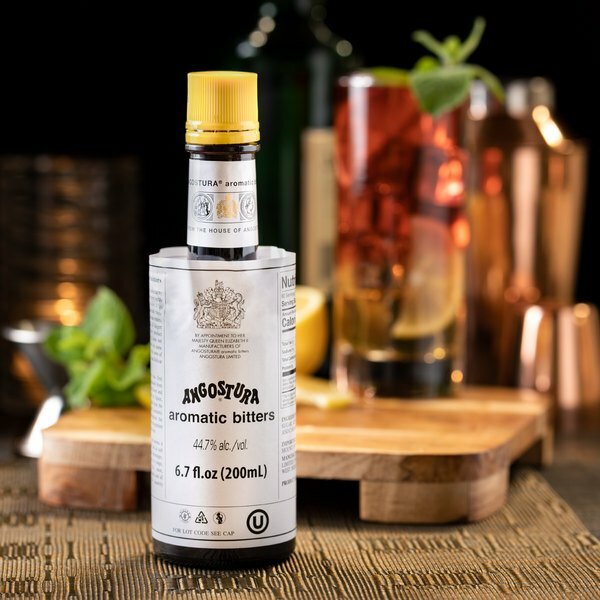 Use Angostura bitters as an herbal-based ingredient to add a subtle spicy flavor and aroma to your crowd-pleasing cocktails and mixed drinks! The name Angostura comes from the town of Angostrua, Venezuela where the flavoring was first produced. This concentrated, botanically-infused alcoholic mixture includes water, 44.7% alcohol, herbs and spices. This petite 6.7 oz. bottle of bitters can be used for multiple cocktails since it is to be ingested in small amounts as a flavoring. The herbal essences of Angostura bitters are well-suited for whiskey and rum drinks and add structure and complexity to fruity cocktails. Serve an Old Fashioned classic cocktail at your bar, restaurant, or lounge made with whiskey, bitters, sugar, and water. 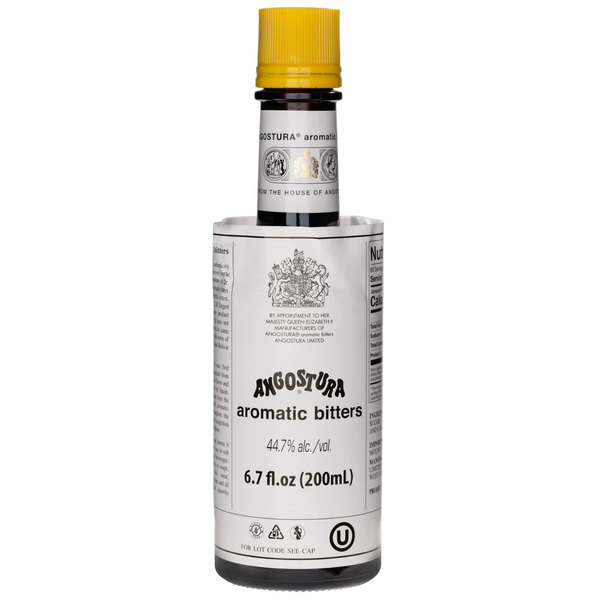 Angostura bitters can also be used in mojitos, Manhattans, Island Breezes, and more. Bitter and tangy to the taste, bitters are reminiscent of cinnamon, cardamom, anise, and cloves. This 6.7 oz. bottle of Angostura bitters features a distinctive over-sized label for easy identification. Known to enhance the flavor of ingredients without masking their true flavor, bitters are also known as a restorative concentrate that may help ease an upset stomach. Certain classic cocktails and mixed drinks just won't taste the same without Angostura bitters! This product is amazing. It is so versatile in a whole bunch of different cocktails. My bartenders love messing around and coming up with new ways to use it. Excellent product. I wish it was sold in larger quantities, its very easy to go through this size even with small usage amounts. The taste of it is excellent and it is a bar staple. I'm always stuck between even using bitters, don't notice the flavor really until someone showed me how to use correctly, now all is good. we can't live without it. Angostura bitters is one of the best bitters on the market. Do yourself a favor and just go with the bigger bottle you will use it. The larger size is better for the amount that we use to make cocktails. The bitters are great and perfect for making all of our classics and more. I'ts authentic bitters. Great for for cocktails, and added to a 3/4 soda water and 1/4 ginger ale great for upset stomachs! Always keep some on hand, even at home. An absolute must for any bar or restaurant that serves drinks. Goes in a lot of classic drinks such as the Old Fashioned or the Manhattan. Make sure to order some for you. They make the drinks taste much better. It has a taste that reminds me of cloves, but there are much more spices in there. You will not find a reasonable price for such a good quality product anywhere else! My party was such a success because Webstaurant has all my party needs without breaking the piggy bank! 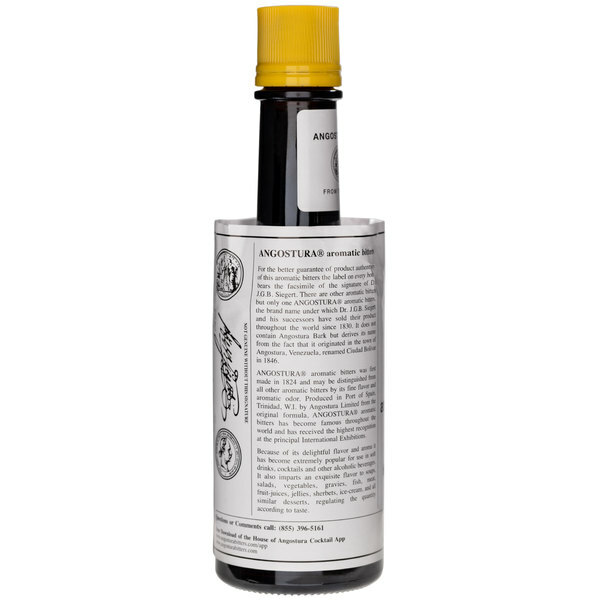 Webstaurant sells these classic bitters at the most competitive price . They are essential for every bar because it is included in many of the classic cocktails. This is a great price for this well known brand of bitters. These are a must have for our rum punches and moscow mules. A little goes a long way! Bitters, cheaper than grocery store. fast delivery and product was very well packed. box was a tad bit big for a few bottles but they didn't come broken. Taste of this was as expected! Great for flavoring drinks and cocktails. It was well packed so it arrived intact. The price was better than expected. Angostura Bitters is the perfect flavoring for many drinks. It adds so much flavor to the many drinks I concoct. Namely the old fashioned, I would highly recommend bitters to anyone with a knack for a flavorful surprise. This is an awesome, classic bitters - it adds a lot of volume to drinks that might otherwise be a bit too simple. A staple. I don't know what exactly to say about Angostura Bitters, but they do the job! We use them for Manhattans and other cocktails containing bitters. No complaints. We use this brand of bitters in our bar on a daily basis. This is by far the most reasonable price for this product. Easy to order. This is a traditional and great bitter to keep on your bar shelf. It is a must have for anyone who likes cocktails in my book. I would definitely recommend this to everyone. It adds a great punch to cocktails. This is one of the best bitters available on the market. It will enhance any cocktail or drink that calls for bitters. If your looking for top quality bitters then look no further.